History: “I’m sick of being in kitchens,” Kyle McKnight told Kara Patt in 2014 inside a Seattle bar. He was explaining his homemade ginger beer recipe to her that he came up with two-and-a-half years prior and hinting that maybe they could do something with it. Back then, McKnight was selling the ginger beer in a restaurant and it was going faster than the food. Patt also came from the food industry. She had 18 years of experience and received a masters from NYU in food studies. She wanted something new as well. She told us over the phone, “I wanted to start my own business and do it in the right way…. This ginger beer tasted like the right ticket.” Shortly after their encounter, they both quit their jobs to devote themselves to Timber City Ginger. The independent bottlers started in Seattle farmer’s markets, growing from two to seven and then to online sales. This is a sassy ginger beer, one with attitude, defiant even. The company proclaims on its website, “This is not a soda – This is a tonic: an elixir.” Hmm. Sometimes I put on a Kobe Bryant jersey, go to the Y, and get hot from the 3-point line. But at the end of the day, I’m still just an un-athletic white dude who writes about soda on the Internet. Point is, we think it’s still safe to call this soda. 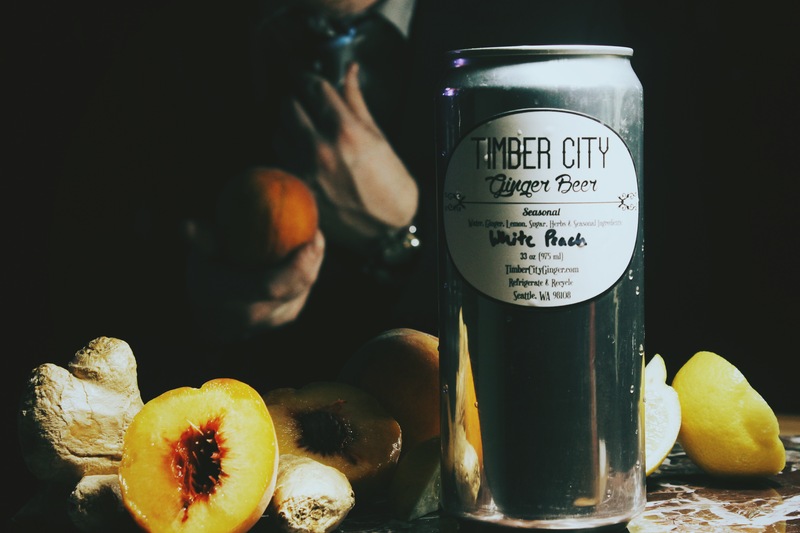 But we understand why they prefer the term “tonic.” Timber City Ginger produces a ginger beer that is noticeably less sweet, made with local Washington produce and herbs. Sage and thyme are used in every batch, and according to Patt, “The herbs are what really make it stand out.” The ginger itself does not come from Washington, as it’s not grown there. But don’t worry, you’ll get your money’s worth; there’s almost a pound of fresh ginger in every gallon of ginger beer. As you might imagine with a beverage this artisanal, there’s no preservatives or artificial flavors used. The use of local ingredients also leads to lots of seasonal favor variations on their signature ginger beer, including today’s review, white peach. They call the majority of ginger beers on the market today “formulaic” and “sugar saturated.” They’re certainly proud of their more botanical approach. “People will come in a cold rainstorm and buy the ginger beer,” says Patt. That’s a lot confidence to drink in. Let’s see how it tastes. Where to get: If you aren’t in the Seattle area, you can buy Timber City Ginger Beer in 32 oz. cans, swing top bottles, or in syrup concentrate at the company’s website. Eventually, Patt and McKnight would like to expand Timber City Ginger down the west coast and perhaps open a branch in Colorado, where Patt is from. Nose: Lemon; pink lemonade; earthy ginger. This is a beautiful desaturated pink hue and has the matching pink lemonade smell. Olfactory heaven. Taste: Bitter lemon; crisp ginger; faint peach; mild sugar. This is definitely an earthier ginger beer, tinged with a mild peachy sweetness. Everything here tastes very authentic. You’ll taste the lemon first. Very fresh and definitely bringing a bitterness. 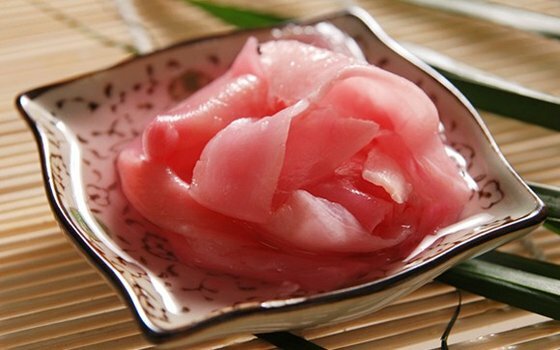 The ginger has light savory notes on its own and gives off a little bit of a pickled ginger (the stuff you get with sushi) taste when combined with the peach. That savory aspect tastes familiar. It’s unquestionably sage, an herb Timber City Ginger uses in every batch. 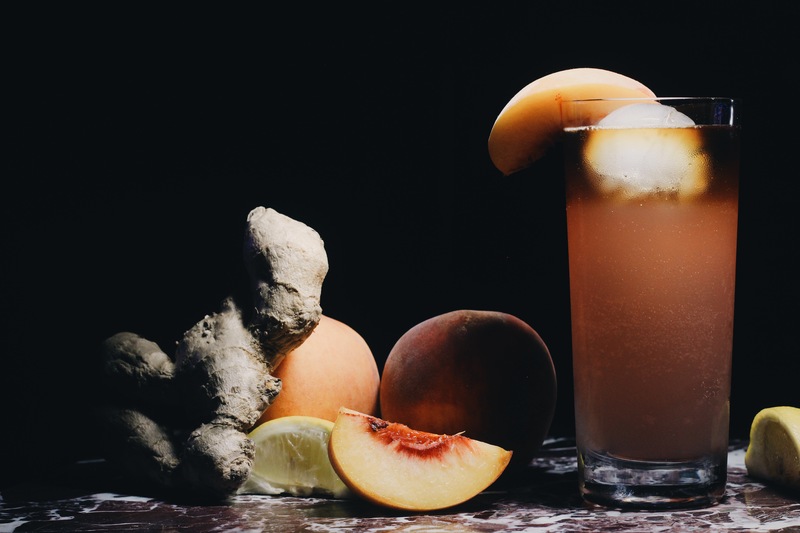 The sweetness in this ginger beer really comes from the peach. It elevates the sugar in the flavor profile and gives the ginger beer a signature flavor. It’s not too sweet, but enough to make this easily drinkable without rum or vodka. I’d say a 5/10 on the sugar scale. The peach also imparts a little bit of a floral taste when combined with the botanical ginger flavor. This gets mildly sweeter as you continue to drink it, and the peach flavor really elevates to the top of the flavor profile. Finish: Bitter lemon notes with peppery ginger that lingers until the next sip. The ginger sticks around long after the peach flavor has faded to remind you just who owns this soda tonic soda. Rating: Ginger beers are a dime-a-dozen these days, but what separates Timber City Ginger’s concoctions from the rest of the market is the signature freshness they capture in each giant silver can of ginger beer. The ginger tastes like you chopped off a fresh piece and ate it. The peach flavor is real and not from a candy store. Together, the two work well. Now, in addition to being extremely popular, ginger is a flavor that can really vary in character from soda to soda. Timber City Ginger went with an earthier, slightly floral take with mild sweetness. If you’re someone who likes a lot of sweetness in their moscow mule, this probably isn’t the ginger beer for you. Sugar isn’t where this ginger beer shines, but there are some sweeter elements. The peach notes blend with the sugar to create sweet, floral flavors. These contrast with the peppery, savory ginger notes to form a little bit of a pickled ginger taste. This is probably the best flavor in the entire drink. You’ve seen pickled ginger on those sushi dates you overpaid for and didn’t take the girl home on. Personally, I wouldn’t mind seeing the cane sugar upped just a little bit to open up those peach notes more. I also think if the ginger had more heat, both the ginger and peach flavors would stand out more on the palate. Lovers of earthier, more natural sodas will almost certainly enjoy this take on ginger beer. Its versatility allows it to be enjoyed on its own as a sipper or as a great peach-infused dark and stormy. Start with the first, pass out with the latter.